Powerful domestique Matteo Tosatto is the latest addition to the Saxo Bank-SunGard team for 2011, moving across to the Danish team on a one year deal after five seasons with the Quick Step team. 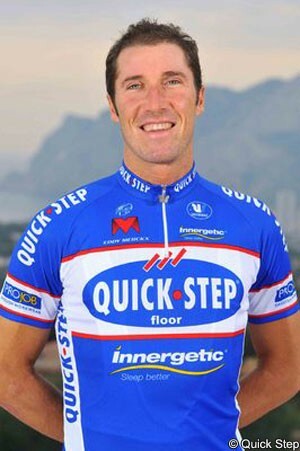 The 36 year old Italian won a stage in the Giro d’Italia in 2001 and took stage 18 of the Tour de France in 2006, but since then has spent the bulk of his time and energy riding in support of others. He will fill the same role in Saxo Bank-SunGard, backing the designated leaders in races. Tosatto is hailed by his new team as ‘one of the best supporting cyclists in the peloton.’ Saxo Bank-SunGard owner Bjarne Riis believes he is going to be a valuable addition. He will meet up with his new team-mates at the first Saxo Bank-SunGard training camp in Fuerteventura. That begins November 28th and while he will have to wait until the end of the year to change the colour of his jersey, his time with the new team will begin there.